Emails get self-destruct option Jump to media player A New York-based start-up says it has a solution to keep emails private - self destructing them. Apps in pockets, bums on seats Jump to media player With the Orange Wednesdays cinema offer coming to an end, Dave Lee looks at other ways to make going to the movies more affordable. Apps promoting creativity on the move Jump to media player How the power of mobile devices is allowing us to get creative while on the go. App helps you wake up with a stranger Jump to media player The app that turns a global network of strangers into your alarm clock, with a dating twist. 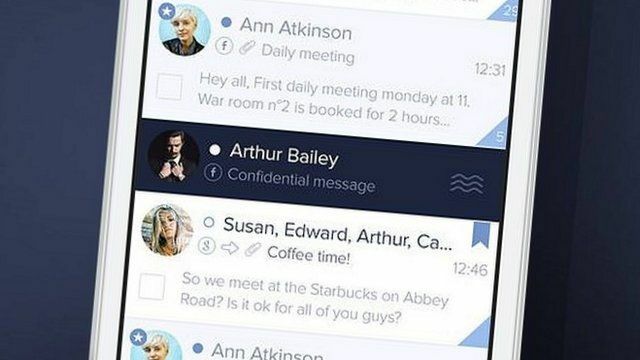 More than 200 billion emails are sent across the planet every day, and one New York-based start-up says it has a solution to keep them private. Confidential CC is an Android and iOS app which which features self-destructing, encrypted emails that can be viewed only once. They also cannot be forwarded or printed. But how secure is it, and will it really take off? Previous attempts to secure email have enjoyed only limited success. The BBC's Richard Taylor was given a demo of the service by its co-founder Rachel Tigges.